Everyone occassionally has a question or two about our boots. We hope this helps. 1. What is the difference between a D width and a EE width? 2. What does "waterproof" mean exactly? 3. 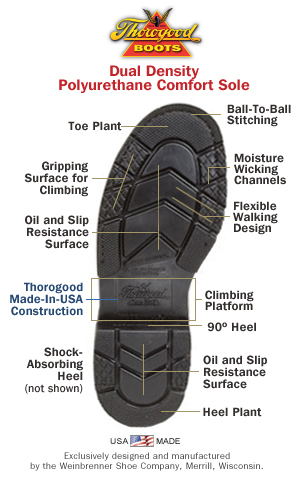 What features come with the Thorogood "Comfort Sole" Outsole? 4. What does "SD Type 1" mean exactly? 5. How "insulated" is insulated? 6. What is an "I-Met" internal metatarsal guard? 7. What are the requirements for an "EH (Electrical Hazard)" boot? 8. What exactly is special about a "wedge" sole? 9. What makes Thorogood's "SoftStreets" a soft street sole? 10. How does the Vibram® "heat resisting" perform? 11. Why is the "logger boot" outsole so different than other outsoles? 12. Explain the "ASTM" codes. What do they mean? 13. Is there a better "bow knot" for tying shoelaces? 14. Is there a reason my boots wear unevenly? The approxiamate difference is 3/8 of an inch...or a little more than the thickness of a ball point pen...or a thick pair of socks. It means you should be able to stand in 5" of water for two hours without the boots leaking. Why you would stand in 4" of water in your leather work boots is another question. 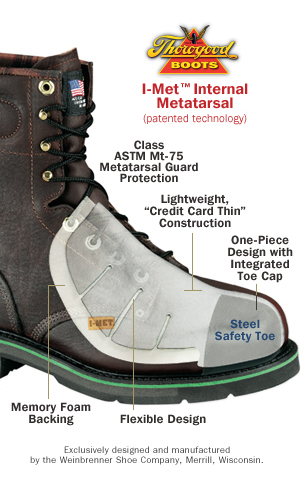 Here is a great description on how to better understand the OSHA and ASTM "Protective Footwear Requirements" (the codes) printed on the label of the work boots you are wearing. doesn't do the trick - here's a suggested "better" bow knot you can try. most of the working day. So, it's not always a defect in the footwear. Sometimes it's just how we walk. 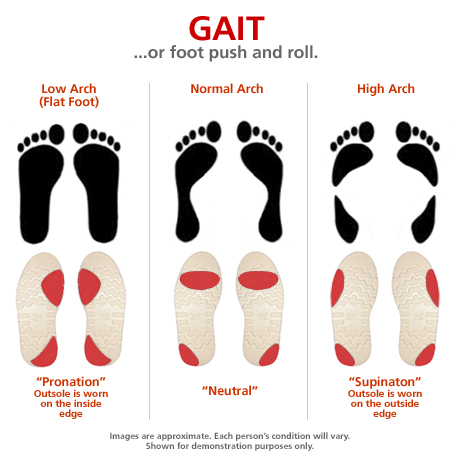 FYI: Your gait can be "neutalized" with the help of over-the counter or prescription orthotics. A neutral gait will help boots wear more evenly, providing longer usage. If these answers have not helped you at all...call us toll-free at 1-800-723-5384.